Section 1 – Survey of the team’s current behavior along with a survey of the opinions about the team. Section 2 – The Everything DiSC® assessment. Team dynamics are an important predictor of organizational health. Teams that work well together perform better. 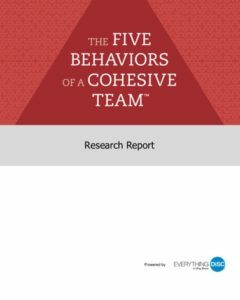 Download The Five Behaviors™of a Cohesive Team Powered by Everything DiSC®Research Report now.